Developer PikPok made a name for itself releasing simple and addictive games for iPhone and iPad, with such titles as Flick Kick Chelsea and Flick Kick Field Goal. Now, like most companies these days, the studio has a zombie game all its own, this one called Into the Dead. Quite frankly, it looks great. Available free-of-charge December 6, this on-rails first-person title challenges players to see how far they can run through a fictional environment teeming with undead. 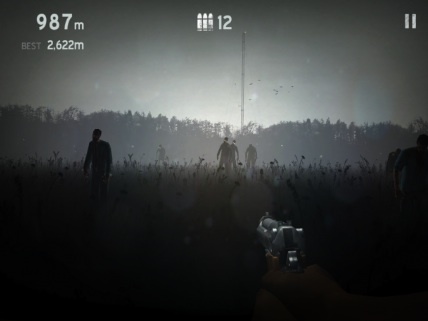 To avoid the horde, they'll use tilt or tap controls to steer their survivor away from the rotting masses, while a small number of weapons (a chainsaw, Magnum and mini gun), let them take down several creatures along the way. 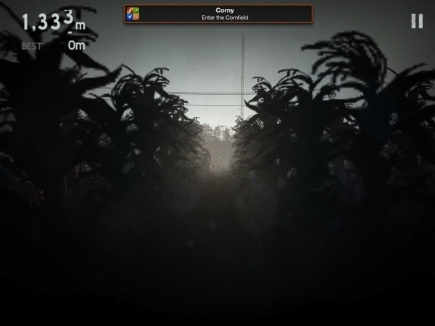 Naturally, things begin easy enough, with gamers dashing through wide-open areas, but these locations eventually change into a dense forest and cornfield. Also, as expected, the number of zombies increase exponentially. We've yet to see Into the Dead in action, but PikPok's latest sounds like the sort of game we'll play well into 2013. Look for a review in the coming days.